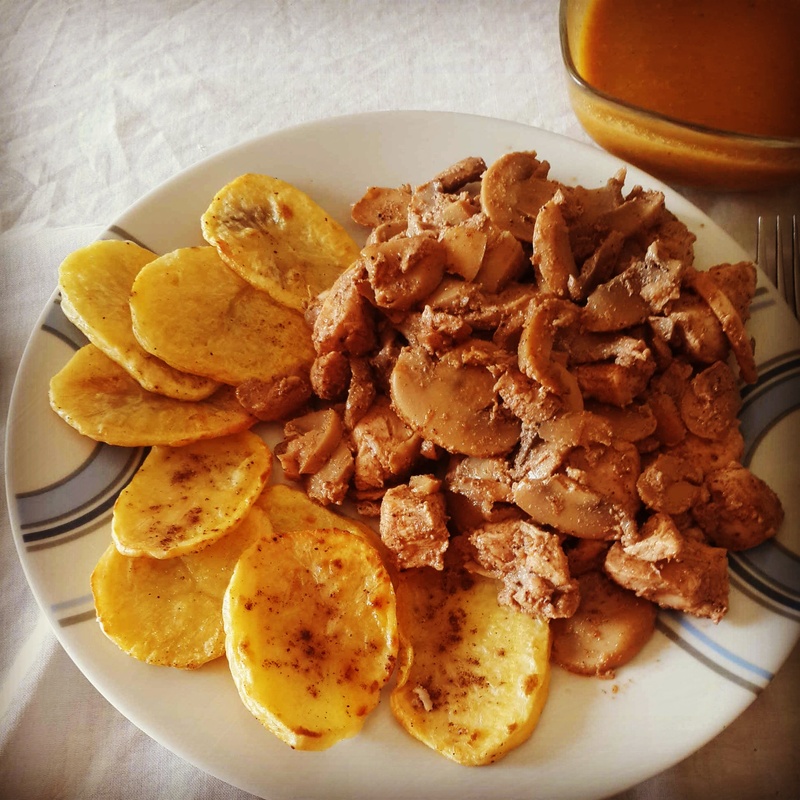 Simple, easy to make and no fat at all is used in today’s meal. 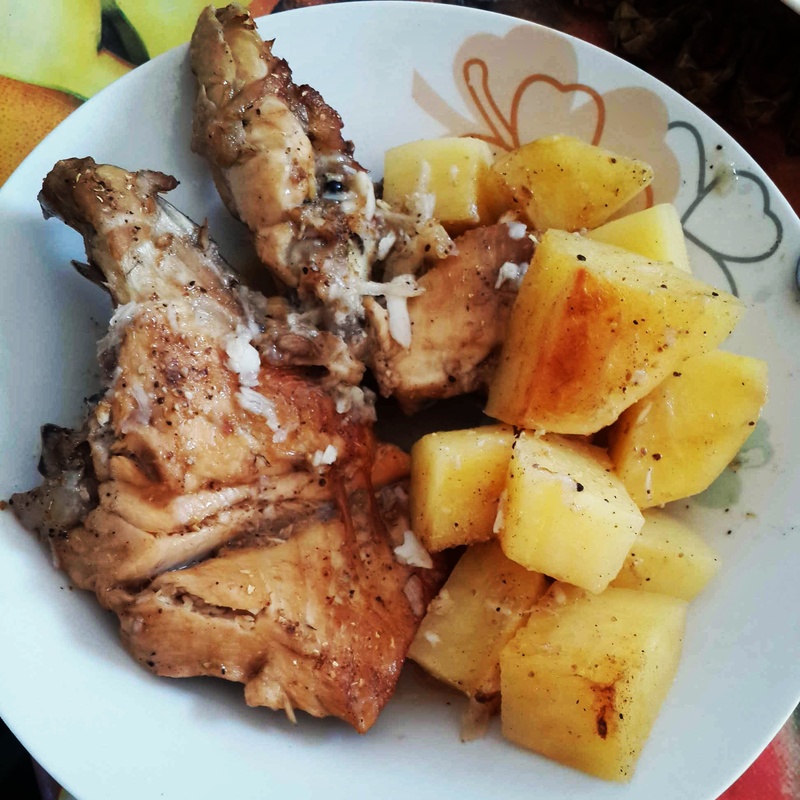 Chicken and potatoes are placed in an oven pan with lemon juice, minced garlic, salt and pepper and some spices namely corriander. The outcome is light and yummy! 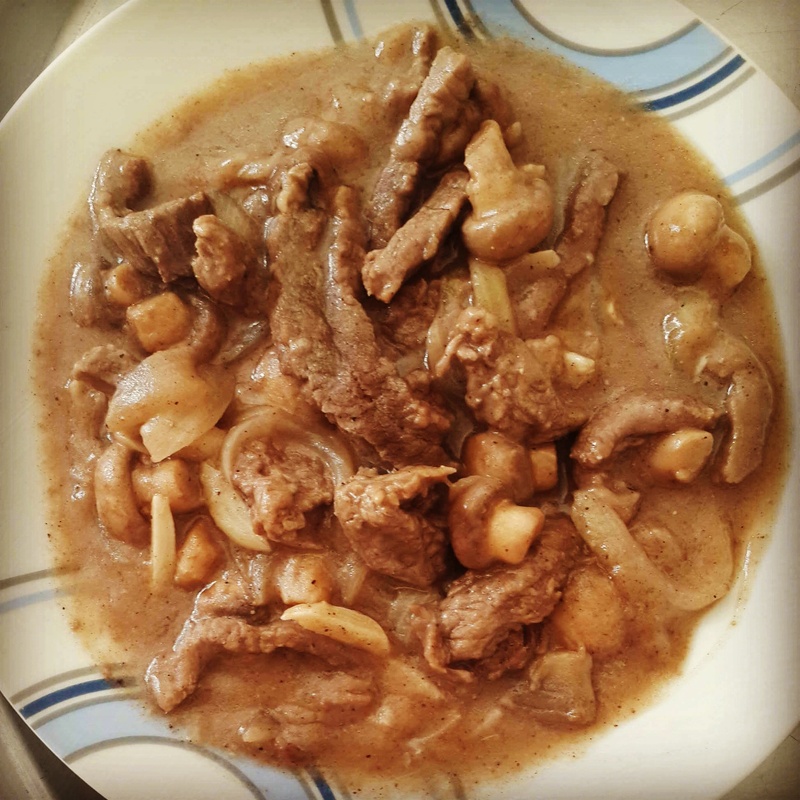 Chicken again.. chose to make it like tawoo2, marinated chicken pieces with some vinegar, yogourt, tomato paste and minced garlic, then placed some mushroom with the chicken. On the side, some baked potato and a newly discovered carrot soup. Note: It was the first day i feel full after a meal!! 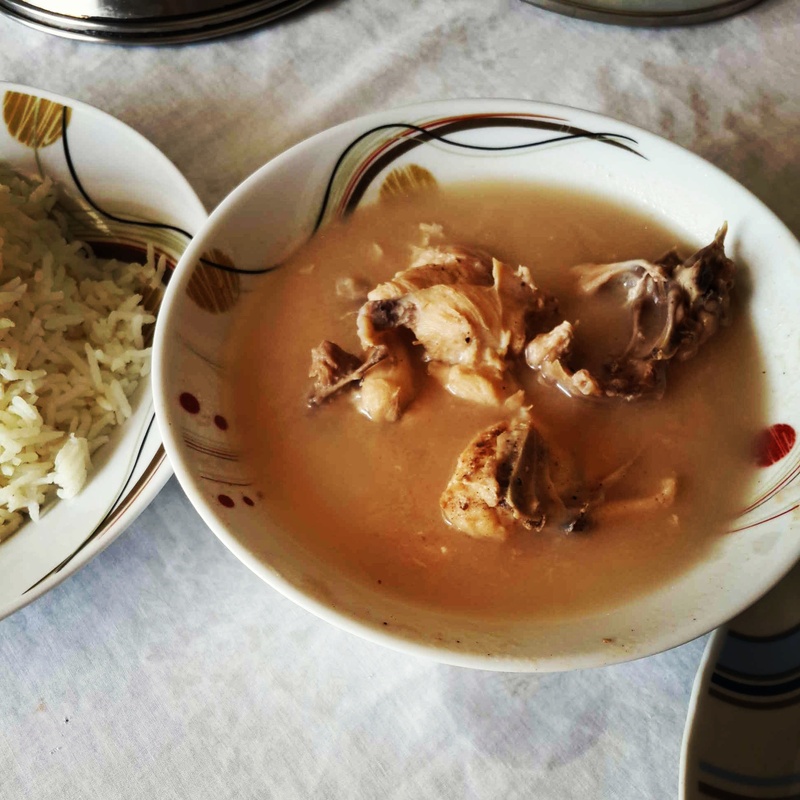 Some chicken broth is what i ate today. 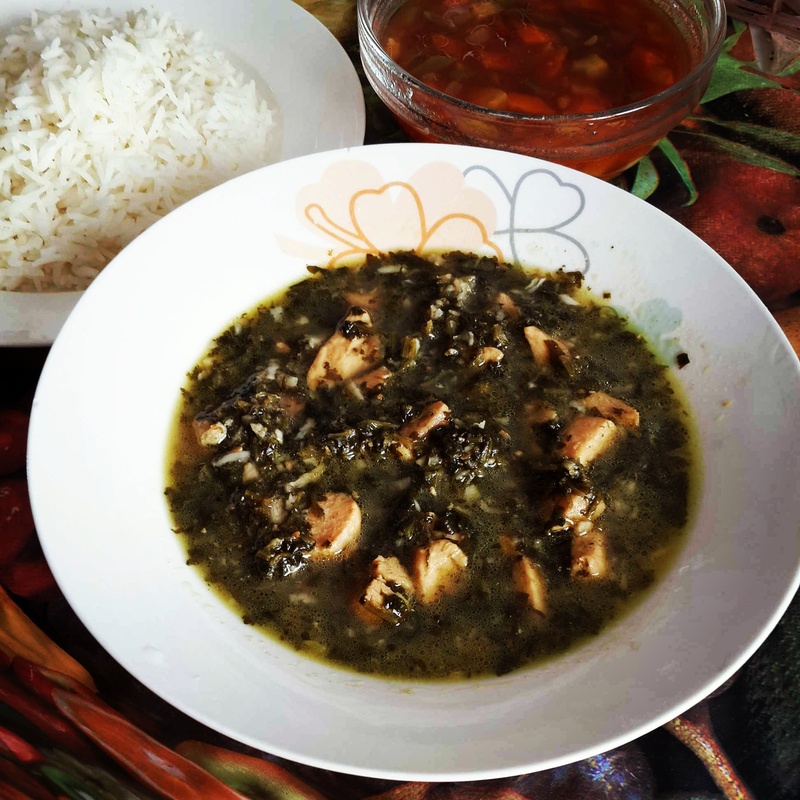 A traditional lebanese dish made with some flour and chicken boiled in water with some spices. 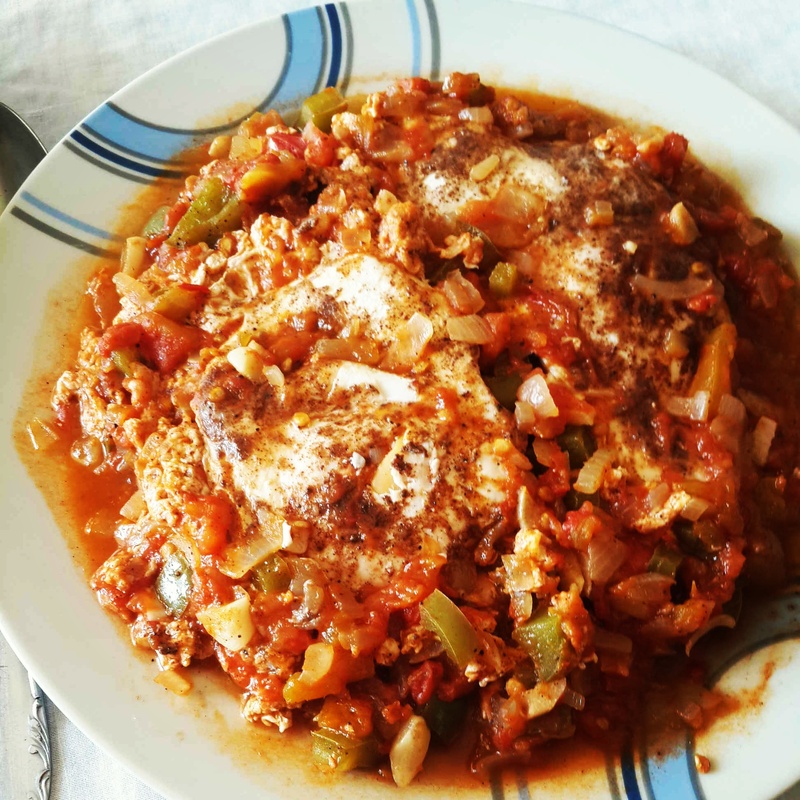 A very traditional dish, “shakshoukeh” is made with eggs placed in tomato sauce with chopped garlic, onion and some green bell peppers. Yummy! 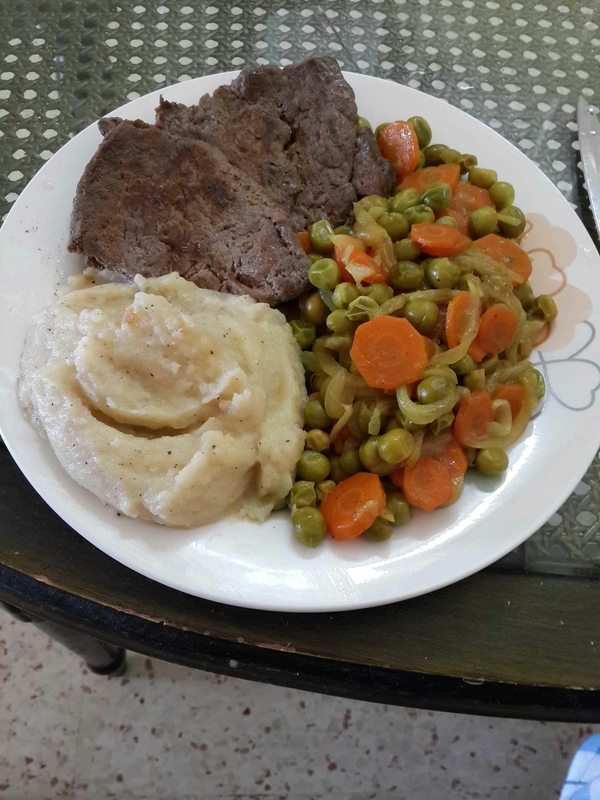 I prepared some green peas with carrots and onions, a steak and one mashed potato.. Delicious! 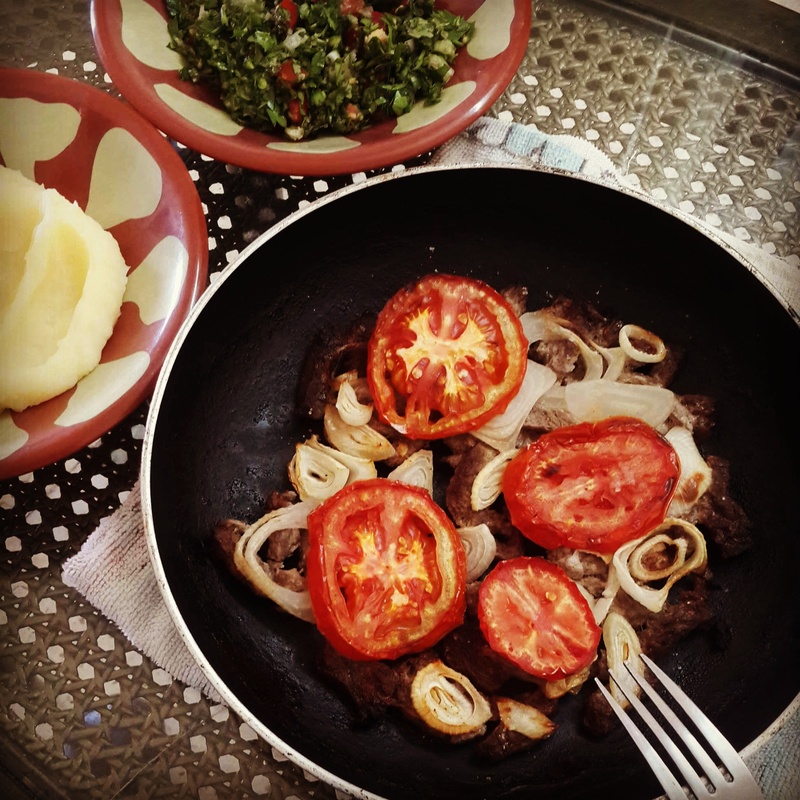 I tried something different with my steak today..cut it into long stripes and marinated them in a special combination with vinegar and spices.. a tomato and some onions for garnish and grilled them in the oven.. it looked and tasted well, close enough to that of lebanese shawerma.. nicely done don’t you think? 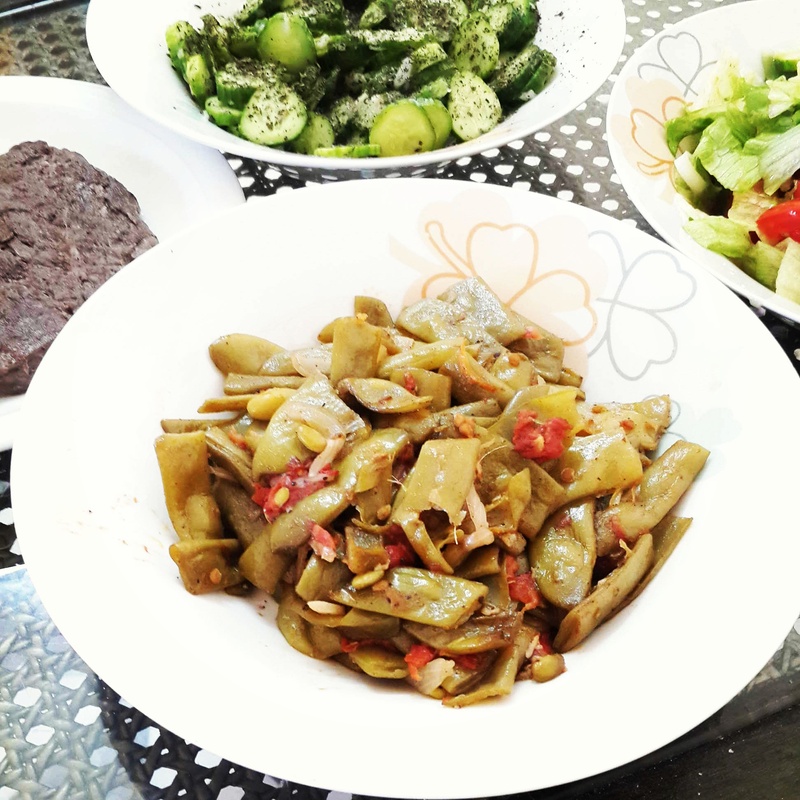 Today’s menu was simple but quite satisfying: a piece of steak, some green beens cooked with onion, garlic, and fresh tomatoes, a special cucumber salad with vinegar, garlic, and dried mint and a classical fresh salad on the side. 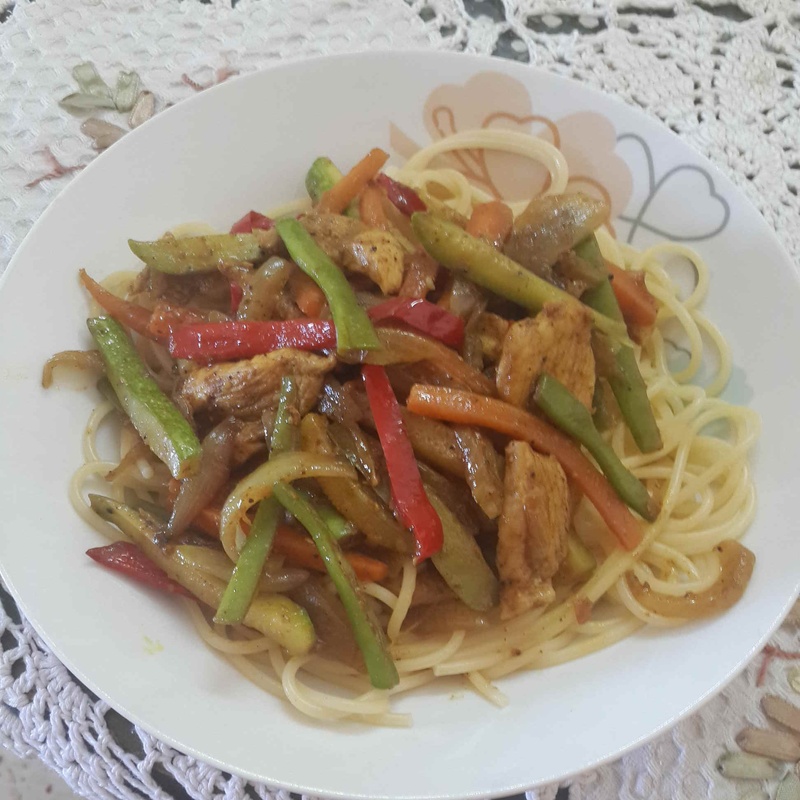 Today on the menu was a favorite dish of mine: pasta of vegetables and chicken breast with soja sauce.. yummy! !